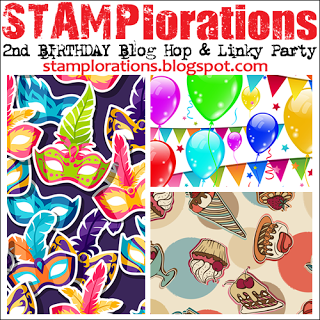 It's our final day of the STAMPlorations 2nd Birthday Blog Hop. Hope you've enjoyed seeing all the different creations with these fabulous new stamps! For today's card I applied Distress Paints in Salty Ocean, Tumbled Glass and a touch of Mustard Seed, spritzed them and watched them merge into each other seamlessly. Then I stamped the images from Party Mates and lifted out some of the colour with a pet paintbrush. I stamped the sentiment on a strip of white card then added it across the panel. Our Guest Designer for this final day of the hop is the amazing Jennifer Ingle! Check out what Jennifer and the rest of the team made! 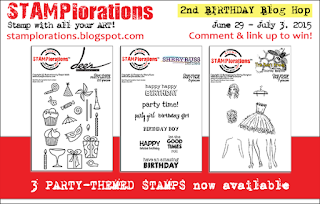 You'll find links to all birthday blog hop projects here. Love that salty ocean colour, so summery and great for a boy! Love how u blend the colors so perfectly, a Happy creation for a birthday boy! Gorgeous color blending. Makes that background so eye-catching. A great card for any boy, Shirley! Seriously...your DIs merged seamlessly with a spritz of water? I am in AWE with the results! You have the magic touch with these inks (care to send some of that my way, please!). Beautiful background for those fun images! This made a great background for your pretty card! Love that ombre background and the clear crisp black images on top. Such an adorable card. Love the blue with black stamped images! 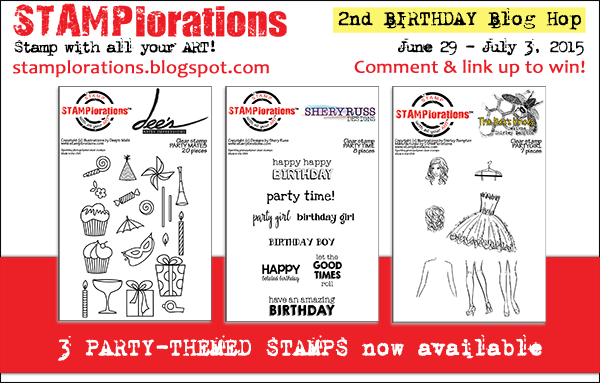 Love your watercolored background stamped with lined birthday stamps. TFS Shirley. great inking--I wouldn't have thought of mustard seed here, but it's lovely! Great background, very impressive! Great masculine card too! That inky action is AWESOME. 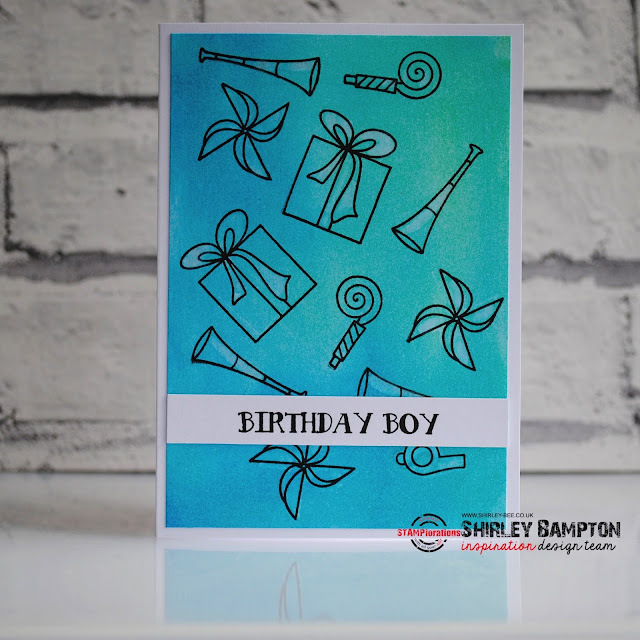 So simple & fun for a boy card! Love it! Gorgeous, the background is super pretty! Love the background! Great card!